Summer is over and it's almost time for Love to go back to school. But her Aunt Mable's still acting weird, her Dad (a.k.a. 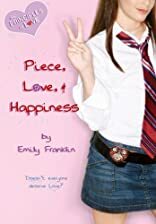 principal of her prep school) is preoccupied, her ex is exiled in Europe, and former friends like Cordelia have bonded with the evil Lindsay Parrish. Now, Love's playing host to the new exchange student from London, Arabella Piece, who has some secrets of her own. Love's certainly been distracted by the boys of summer, but she has to watch what she says because it seems like everyone's got something to hide lately-including herself. About Emily Franklin (Author) : Emily Franklin is a published author of young adult books. Some of the published credits of Emily Franklin include The Other Half of Me, Slippery Slopes: Chalet Girls, Slippery Slopes.